The numerical aperture (NA) of an optical system (e.g. an imaging system) is a measure for its angular acceptance for incoming light. It is defined based on geometric considerations and is thus a theoretical parameter which is calculated from the optical design. It cannot be directly measured, except in limiting cases with rather large apertures and negligible diffraction effects. For the maximum incidence angle, it is demanded that the light can get through the whole system and not only through an entrance aperture. Figure 1: A collimating lens can theoretically accept light from a cone, the opening angle of which is limited by its size. The extreme rays are limited by the size of the lens, or in some cases somewhat less if there is a non-transparent facet. It is often not recommended to operate a lens or its full area, since there could be substantial spherical aberrations. The numerical aperture, however, is a completely geometrical measure, which is not considering such aspects. The numerical aperture depends on the location of the object plane determined by the designer! In the example case above, the numerical aperture of the lens is determined by its diameter and its focal length. Note, however, that a lens may not be designed for collimating light, but for example for imaging objects in a larger distance. In that case, one will consider rays coming from that object distance, and the obtained numerical aperture will be correspondingly smaller – sometimes even much smaller. This shows that the numerical aperture depends on the location of some object plane determined by the designer according to the intended use. where D is the aperture diameter, f the focal length and λ the optical wavelength. The calculation is based on the paraxial approximation and therefore not accurate for cases with very high NA. A somewhat smaller spot size may be possible with correspondingly larger input beam radius, if the performance is not spoiled by aberrations. In case of doubt, one should ask the manufacturer what maximum input beam radius is appropriate for a certain lens. In players and recorders of optical data storage media such as CDs, DVDs and Blu-ray Discs it is important to focus laser light to a small spot (pit) and receive light from such a spot. Lenses with high NA are also required for collimating laser beams which originate from small apertures. For example, this is the case for low-power single-mode laser diodes. When a lens with too low NA is used, the resulting collimated beam can be distorted (aberrated) or even truncated. The same kind of considerations apply to microscope objectives. Such an objective is designed for operation with a certain working distance, and depending on the type of microscope with which it is supposed to be used, it may be designed for producing an image at a finite distance or at infinity. In any case, the opening angle on which the numerical aperture definition is based is taken from the center of the intended object plane. It is usually limited by the optical aperture on the object side, i.e., at the light entrance. In many cases, the light input comes from air, where the refractive index is close to 1. The numerical aperture is then necessarily smaller than 1, but for some microscope objectives it is at least not much lower, for example 0.9. Other microscope objectives for particularly high image resolution are designed for the use of some immersion oil between the object and the entrance aperture. Due to its higher refractive index (often somewhat above 1.5), the numerical aperture can then be significantly larger than 1 (for example, 1.3). It determines how bright the observed image can be for a given illumination intensity. Obviously, a high-NA objective can collect more light than one with a low numerical aperture. More importantly, the NA sets a limit to the obtained spatial resolution: the finest resolvable details have a diameter of approximately λ / (2 NA), assuming that the objective does not produce excessive image aberrations. A high NA leads to a small depth of field: only objects within a small range of distances from the objective can be seen with a sharp image. In photography, it is not common to specify the numerical aperture of an objective, because such objectives are not thought to be used with a fixed working distance. Instead, one often specifies the aperture size with the so-called f number (formula symbol N), which is the focal length divided by the diameter of the entrance pupil. Although an optical fiber or other kind of waveguide can be seen as a special kind of optical system, there are some special aspects of the term numerical aperture in such cases. Figure 2: An incident light ray is first refracted and then undergoes total internal reflection at the core–cladding interface. However, that works only if the incidence angle is not too large. Here, n0 is the refractive index of the medium around the fiber, which is close to 1 in case of air. Note that for a different input medium with higher refractive index, the maximum input angle will be smaller, but the numerical aperture remains unchanged. It is assumed that the external medium is air (n = 1), and that the index contrast is small. For fibers or other waveguides not having a step-index profile, the concept of the numerical aperture becomes questionable. The maximum input ray angle then generally depends on the position of the input surface. Some authors calculate the numerical aperture of a graded-index fiber based on the maximum refractive index difference between core and cladding, using the equation derived for step-index fibers. Light propagation in most optical fibers, and particularly in single-mode fibers, cannot be properly described based on a purely geometrical picture, because the wave nature of light is very important. Therefore, there is no close relation between fiber modes and the numerical aperture. High-NA fibers tend to have modes with larger divergence of the light exiting the fiber. However, that beam divergence also depends on the core diameter. 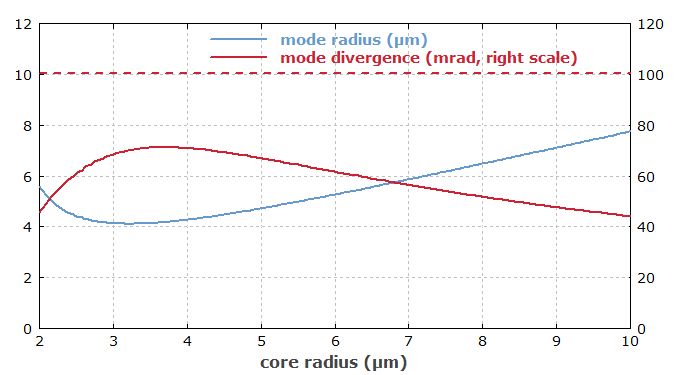 As an example, Figure 1 shows how the mode radius and mode divergence of a fiber depend on the core radius for fixed value of the numerical aperture. The mode divergence stays well below the numerical aperture. Figure 3: Mode radius and divergence angle for the fundamental mode of a step-index fiber as functions of the core radius for a fixed numerical aperture of 0.1 and the wavelength of 1000 nm. 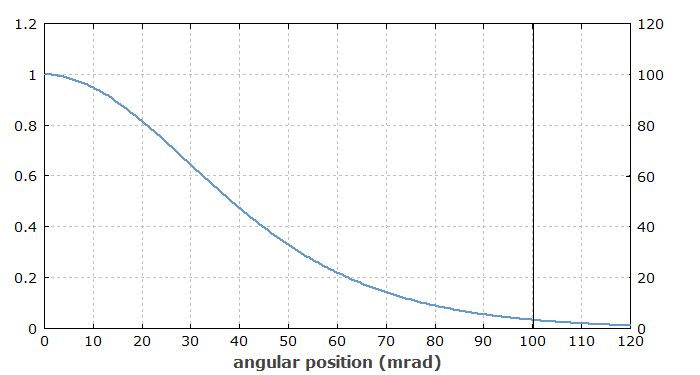 In Figure 2 one can see that the angular intensity distributions somewhat extends beyond the value corresponding to the numerical aperture. This demonstrates that the angular limit from the purely geometrical consideration is not a strict limit for waves. Figure 4: Far field intensity distribution of a fiber mode at 1000 nm for a core radius of 3.5 μm, a numerical aperture of all 0.1. The intensity distribution somewhat extends beyond the value corresponding to the numerical aperture (see the vertical line). For a single-mode fiber, the NA is typically of the order of 0.1, but can vary roughly between 0.05 and 0.4. Multimode fibers typically have a higher numerical aperture of e.g. 0.3. Very high values are possible for photonic crystal fibers. For a given mode area, a fiber with higher NA is more strongly guiding, i.e. it will generally support a larger number of modes. Single-mode guidance requires a smaller core diameter. The corresponding mode area is smaller, and the divergence of the beam exiting the fiber is larger. The fiber nonlinearity is correspondingly increased. Conversely, a large mode area single-mode fiber must have a low NA. Bend losses are reduced; the fiber can be more strongly bent before bend losses become significant. The higher doping concentration of the fiber core (e.g. with germanium), as required for increasing the refractive index difference, may increase scattering losses. The same can be caused by irregularities of the core/cladding interface, which are more important for a larger index difference. A low NA increases the influence of random refractive index variations. Therefore, fibers with very low NA may exhibit increased propagation losses.